Tag Archives for " Google featured snippet "
For businesses today, reaching that coveted #1 spot on Google is still a main goal, and as ideal as that position is, there’s now another spot that marketers should strive for that is referred to as “position zero” or a Google featured snippet. You may have seen the Google featured snippet appear in search results and have just not been aware of what exactly it is, so I wanted to take the time to not only walk through it but also give some helpful tips to help you get there. What is a Google featured snippet and why should you care? The point of featured snippets is to engage the user on search engine results pages (SERPs) and provide the best answer to a user’s questions. The way Google does this is that they have the ability to detect pages that can answer the user’s question (I mean, it’s Google, what can’t they do?). Google will display what they believe is the top result on page one of search results, above organic search results, in the form of either a paragraph, list, or table. The snippet will also include a link to the page, a page title, and the page’s URL. While snippet information is often pulled from the first page of Google, that isn’t always the case, as sometimes answers can be pulled from page two, three, or even further down. The image below is an example of what I’m talking about. When you type in “effective social media plan” into Google, the below snippet will appear and will aim to answer your question without you even having to click through to the website where the answer lives. Now, the real question is, how do you get there? My tips below aren’t necessarily the only assets that can get you to position zero, but they can certainly help. Now, this tip should be at the root of all of your marketing efforts. You must know your audience inside and out in order to effectively reach them. As part of that, you need to have a good understanding of what they’re searching for online and the types of questions they’re asking so that you can properly address them. Back to SEO basics. If you’ve never conducted keyword research, this is a good excuse to begin (as is anything related to search results, really). It’s believed that the majority of featured snippets are triggered by long-tail keywords. 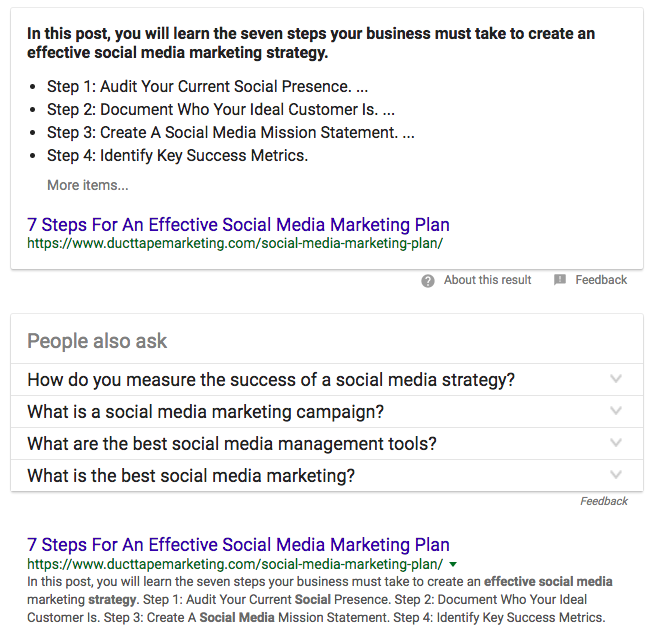 Since the purpose of featured snippets is to answer a question, I’d recommend starting your keyword research with question-based search queries, as well as queries with an informational intent (like the “effective social media plan” example above). Browsing Google and looking at “searches related to ‘search term'” at the bottom of SERPs or “People also ask” questions that you’ll find in other snippets. Additionally, as you type search terms into Google, it will start to auto-fill related search terms that people have typed in, which can also provide good topics for brainstorming. If you’ve already honed in on a solid content strategy, then chances are you’re already writing posts that cater to your audience’s problems, wants, and needs. But when it comes to content creation with the intent of getting to position zero, you may want to go more in-depth with the answers and make it clear that you are answering a question. In terms of going in depth, you are not the only person writing about your topic online, I can almost guarantee it. So, to stand out from the crowd, don’t just skim the surface of an answer. You must go in-depth because that’s what will make your answer the best out of all others out there and will increase your odds of getting the snippet. The feel of the content shouldn’t differ much from your standard blog posts. They should still be high-quality, entertaining and/or informative, and focused on your audience. I can’t stress the importance of your audience enough. At the end of the day, the content is for them. While getting featured in a snippet is great and all, don’t make it too obvious that that is your intent with the post. Q&As seems to be a popular format for getting Google’s attention. They’re user-friendly and clearly and concisely address common questions. This is by no means the only format to consider, but it may be a good starting point. While not all of the snippets are pulled from page one of Google, the vast majority of them are, so you can’t neglect SEO best practices. Implement on-page SEO tactics – Understand on-page ranking factors and be sure to implement them on your site. Don’t forget about schema markup as well. This is still an often underutilized tool. Enhance your total online presence – Pay attention to inbound links, your citation and directories profile, social media profiles, online reviews, and of course, your content creation. The list goes on, but remember the three ways a snippet can appear (paragraph, list, or table) and try to format your text in a way that would fit those categories. With all of this being said, even after all of this hard work, it may not guarantee you the position zero spot. Even if you don’t reach that position, do not look at it a loss. You’ll still gain a ton of value by working through these processes, including upping your content game and improving your SEO efforts overall, which is a big deal. Position zero would simply be icing on an already awesome cake. Are you working to get to position zero for your company? What efforts are you implementing?